Today was a very productive day thanks to Troubadour and Trobairitz generously spending the day driving me around Salem. After having coffee with some of the riding friends at Coffee Culture on 9th Street, we headed to Salem via the scenic route. 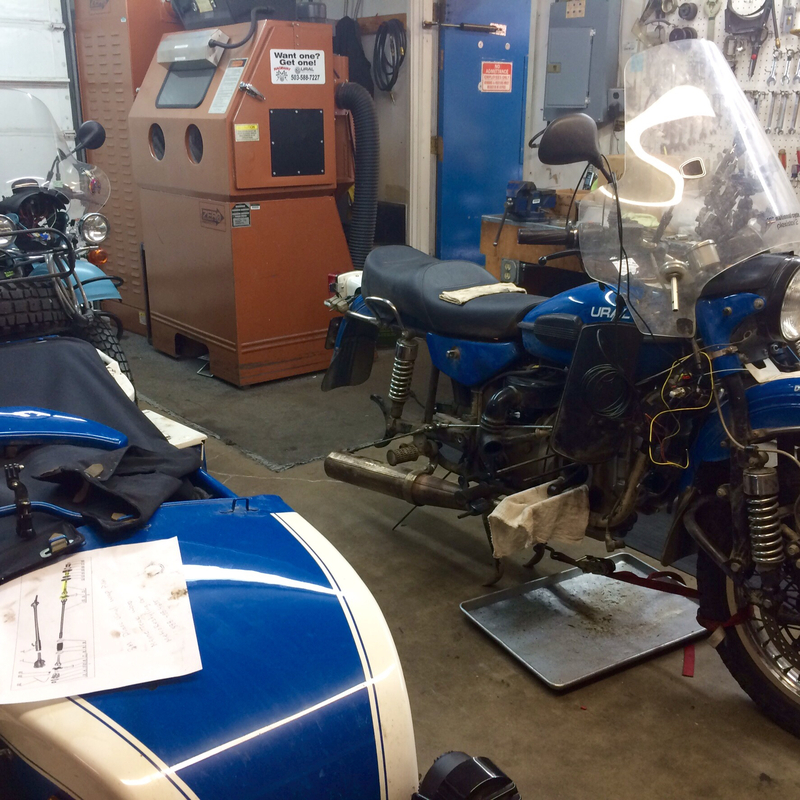 The first stop in Salem was Raceway Ural since we didn't know what time they closed on Saturday. I had wanted to see and hear what parts were being changed and get a look at the worn out parts. The sidecar is disconnected from the tug so the right head and cylinder could be removed. After reinstallation, the alignment will be set. 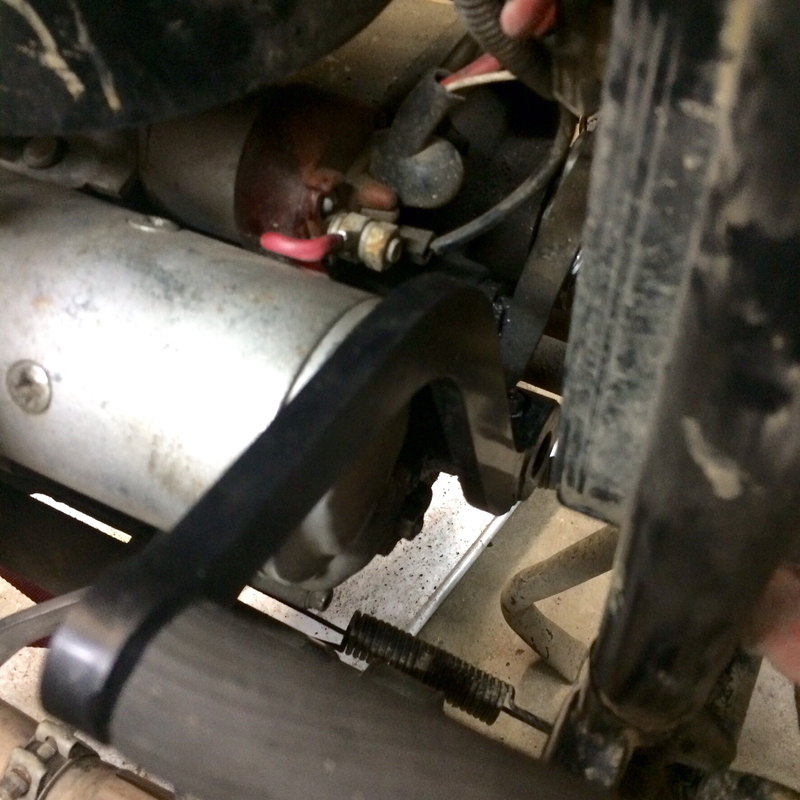 This is the rubber coupling between the output of the transmission and the driveshaft. As you can see, the holes were starting to elongate and had actually broken through in one spot. I had checked the condition of the "donut" before I left but didn't see any evidence of this kind of wear but then again I didn't remove it and look at it either. 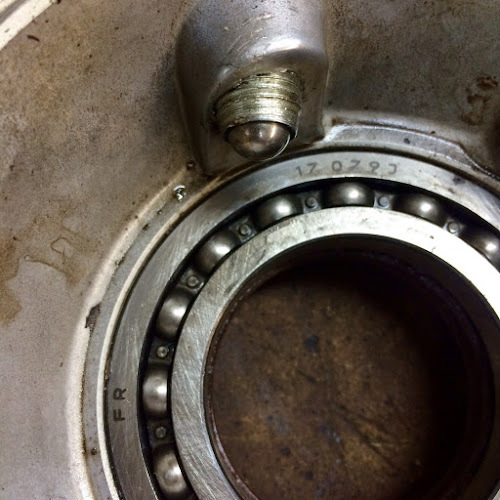 This was one of the problems in the final drive housing. If you look closely you can see the threads worn away. I guess Ural had changed the design of the final drive between 2012 and now so the new parts don't fit the old case. So they are replacing the final drive unit. There were also a lot of metal filings in the drive case which was quite evident when they drained the oil. This is the sidecar axle and you can see the worn splines. They should look like the splines near the u-joint but instead are almost completely gone. This, I knew about before I left on this trip but didn't want to risk destroying the bearing while trying to remove the axle. I didn't think that I would need 2WD so the splines just needed to be able to rotate the driveshaft. Very little load. Not much here except for a fancy black kick start lever. He mentioned that they assumed that the color didn't really matter to me and it doesn't. They still couldn't figure out why the old one failed. I didn't take a picture of the scoring in the bore of the right cylinder but they are replacing that as well. No idea why the scoring but figured that it might explain the oil consumption. Both lifters looked good but the push rods showed some damage. 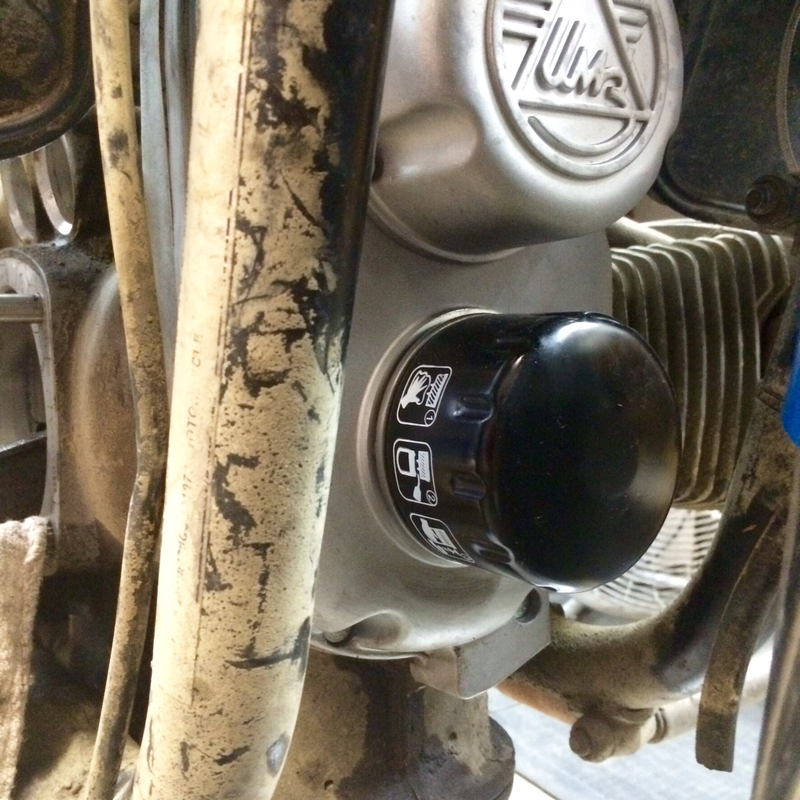 One thing that I asked to be installed was the new style front timing cover to be able to use a spin on oil filter. The cartridge filter was a Ural specific part where the spin on filter was more readily available. 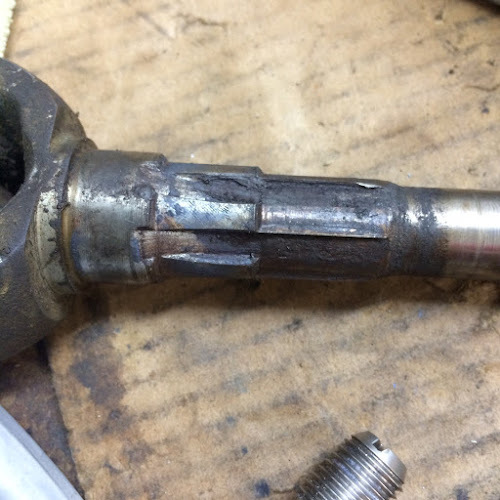 When they installed this, they found that one of the timing cover bolts was broken off and not simply missing like they thought. This would obviously not be covered by the extended warranty. 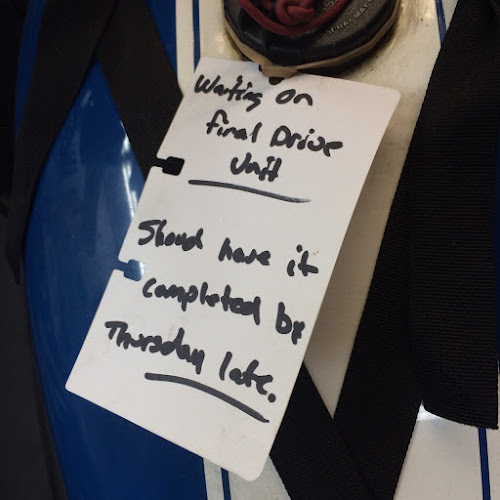 There was a note from the mechanic indicating that he was thinking that it would be done on "Thursday late" which translates to Friday. 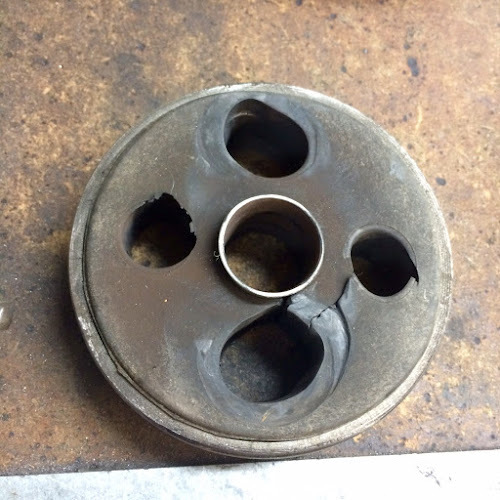 The exhaust header is simply a replacement but he didn't know if the muffler itself was going to need replacement or simply the inlet straightened out. This was only the second of many stops of the day. A huge thank you to these wonderful friends for driving me around and spending the day. That's a long list of things to be fixed. Aren't you glad that you are no longer depending on a schedule? Long list. The part that is taking the most time is what I thought was the simplest, the "jiggly" 2WD shift rod. And, yes, I'm really glad that I have a minimal schedule. long list ideed, but since they're covered by warranty, not too bad. Kudos to Troubadour and Trobairitz for helping you out. No evidence of metal particles in the main oil pan right? Yes, my thanks to them for driving me around and for their company! They said no metal at all on the drain plug. So glad you had good company. I'm not a mechanic and even I can see how badly damaged some of those parts were. What happened? I guess the donut just wears out and Dom had recommended that I carry a spare. I never got one ordered before I left. As to the sidecar drive splines, I don't know. They said 2WD on pavement would do it. Or "flying the car" with 2WD engaged and hard landings. I have no idea on the rigs use by the first owner. Flying the car with 2WD engaged on pavement...I find that one difficult to believe someone would be so stupid. The rig is very hard to steer (think front wheel chained in place) when you have 2WD on and you're on pavement....flying the chair under those conditions, I would suspect hard to do, but then again, there are limits to my stupidity and so I've never done it. They've run into people who do such things and then complain when it breaks. It was a pleasure hanging out with you for the day. Just let us know if you need anything else or want to go for a ride. And thank you again for lunch!